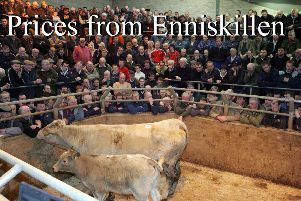 An increased entry of store and beef cattle at Markethill on Saturday 4th August sold in a slightly improved trade in all rings. 250 store cattle returned a firmer demand for all classes. Good quality heavy heifers sold from £190 to £219 per 100 kilos for 508k Char at £1110 from a Crossgar farmer. Angus heifers sold to £218 per 100 kilos for 542k at £1180 from a Banbridge farmer. Top price of £1355 was paid for a 640k Char £210 per 100 kilos from a Cullyhanna farmer. Good quality middleweight heifers sold from £190 to £223 per 100 kilos for 458k Lim at £1020 from a Scarva producer. Second quality heifers sold steadily from £175 to £185 per 100 kilos. Heavy heifers: Crossgar farmer 508k £1110 £291.00; Banbridge farmer 542k £1180 £218.00; Keady farmer 598k £1295 £217.00; Newry farmer 530k £1140 £215.00; Tassagh farmer 564k £1200 £213.00; Cullyhanna farmer 644k £1355 £210.00; Katesbridge farmer 544k £1140 £209.00; Tassagh farmer 544k £1135 £209.00; Keady farmer 556k £1160 £209.00; Poyntzpass farmer 634k £1320 £208.00. Middleweight heifers: Scarva farmer 458k £1020 £223.00; Scarva farmer 476k £990 £208.00; Scarva farmer 466k £965 £207.00; Keady farmer 468k £955 £204.00; Newtownhamilton farmer 486k £985 £203.00; Scarva farmer 482k £970 £201.00; Scarva farmer 472k £940 £199.00; Scarva farmer 450k £895 £199.00; Dromore farmer 490k £950 £194.00. BULLOCKS: Heavy bullocks sold from £190 to £217 paid for 580k Angus at £1270 from a Tandragee farmer and for a 570k Angus at £1235 from a Middletown producer. Top price steer £1430 for 700k £204. Middleweights sold from £188 to £213 for a 408k Char at £870 from a Glenanne farmer. Heavy bullocks: Tandragee farmer 586k £1270 £217.00; Middletown farmer 570k £1235 £217.00; Banbridge famrer 582k £1225 £210.00; Dungannon farmer 670k £1410 £210.00; Dungannon farmer 750k £1560 £208.00; Poyntzpass farmer 658k £1365 £207.00; Poyntzpass farmer 550k £1140 £207.00; Dungannon farmer 644k £1330 £207.00; Richhill farmer 522k £1075 £206.00. Middleweight bullocks: Glenanne farmer 408k £870 £213.00; Moy farmer 458k £920 £201.00; Glenanne farmer 384k £765 £199.00; Glenanne farmer 500k £990 £198.00; Middletown farmer 498k £980 £197.00; Markethill farmer 498k £980 £197.00; Loughgilly farmer 494k £970 £196.00; Markethill farmer 482k £945 £196.00. An entry of 120 weanlings sold in a steady demand. Good quality male calves sold from £220 to £273 for 282k Char at £770 for a Newtownhamilton farmer. Good quality heifers sold from £200 to £256 for 236k Char at £605 from a Newtownhamilton producer. Male weanlings: Newtownhamilton farmer 282k £770 £273.00; Armagh farmer 330k £830 £252.00; Armagh farmer 344k £850 £247.00; Newry farmer 370k £890 £241.00; Ballyward farmer 282k £680 £241.00; Tassagh farmer 252k £600 £238.00; Ballyward farmer 294k £700 £238.00; Tassagh farmer 300k £700 £233.00. Heifer weanlings: Newtownhamilton farmer 236k £605 £256.00; Newry farmer 278k £660 £237.00; Markethill farmer 360k £840 £233.00; Newtownards farmer 322k £740 £230.00; Markethill farmer 336k £720 £214.00; Ballyward farmer 334k £700 £210.00; Newry farmer 266k £575 £216.00. Suckler outfits sold to a top of £1500 for Lim cow and heifer calf with others selling at £1400, !330 and £1070.